American financier; born at Lissa, Poland, in 1740; died in Philadelphia Jan. 6, 1785. It is probable that he left his native country after the partition of Poland in 1772. He settled in New York, and there married Rachel, daughter of Moses B. Franks. When the Revolutionary war began he identified himself with the American cause, and was arrested and imprisoned as a spy soon after the occupation of New York by the British in Sept., 1776. He appears to have been kept in close confinement for a considerable period, but when his linguistic proficiency became known, he was turned over to the Hessian general Heister, who gave him an appointment in the commissariat department. The greater liberty thus accorded him enabled him to be of service to the French and American prisoners, and to assist numbers of, them to effect their escape. He appears to have exerted himself to create dissension among the Hessian officers, prompting many to resign from the service. This led him into difficulties, but on Aug. 11, 1778, he managed to escape from New York, leaving behind property to the amount of five or six thousand pounds sterling, a distressed wife, and a child one month old. It is characteristic of his unselfish nature that when, at this critical period of his career, he addressed a petition to the Continental Congress (Aug. 25, 1778) recounting his services and praying for some employment, he at the same time entered a plea for the exchange of Samuel Demezes, with whom he had been intimate during his imprisonment. Salomon's escape to Philadelphia marks the turning-point in his career. His appeal to Congress met with no success, but it was not long before he succeeded in establishing himself in business, becoming one of the prominent citizens of his adopted city. Early in 1781 he made known through the newspapers that he was a dealer in bills of exchange on France, Saint Eustatius, and Amsterdam. A few days after this announcement Robert Morris became Superintendent of Finance. Morris kept a diary in which he recorded many of his financial transactions, and some idea of the extent to which he relied on Salomon may be gathered from the fact that between Aug., 1781, and April, 1784, Salomon's name appears in the diary not less than seventy-five times. Salomon's services were especially valuable in connection with the negotiation of bills of exchange, by which means the credit of the government was so largely maintained during this period; he was practically the sole agent employed by Morris for this purpose. On July 12, 1782, he requested Morris' permission to publish the fact that he was broker to the Office of Finance; in reference to this Morris entered in his diary: "This broker has been useful to the public interests. . . . I have consented, as I do not see that any disadvantage can possibly arise to the public service, but the reverse; and he expects individual benefits therefrom." But Salomon's activities were not limited to his relations with the government. He had been appointed broker to the French consul and the treasurer of the French army, and fiscal agent of the French minister to the United States, Chevalier de la Luzerne, and in these capacities enormous sums passed through his hands. His large financial transactions made him the principal individual depositor of the Bank of North America, an institution founded through the instrumentality of Robert Morris toserve as a means of obtaining funds to carry on the government. Salomon's accounts filled fifteen pages of the ledger of this bank, and at various times he had specie balances of from $15,000 to $50,000. From these accounts it would appear that Salomon from time to time paid out to Robert Morris sums amounting in the aggregate to $200,000. It is an interesting fact that on a day when Robert Morris deposited $10,000 in the bank, he received exactly the same amount from Haym Salomon. On Aug. 26, 1782, Morris recorded in his diary: "I sent for Salomon and desired him to try every way he could devise to raise money, and then went in quest of it myself." Two days later he wrote: "Salomon the broker came, and I urged him to leave no stone unturned to find out money and the means by which I can obtain it." In 1782 Salomon indorsed the note of a M. de Brassine, who, with M. de Mars, the chief of the French hospital department, was engaged in sundry mercantile ventures which turned out to have been entered into for their own advantage and on account of the French army. When the note became due, it was protested, and at Morris' instance Salomon entered suit against De Brassine and De Mars (March, 1783), and had them both put in jail. On March 20, 1783, Morris recorded in his diary: "I must here, in justice to Haym Salomon, declare that, although he has indorsed the note, I consider him only as a broker in this business, and not liable to pay as an indorser thereof." As De Mars was the responsible party he was forced to make good the amount involved. It is worthy of note that James Wilson, the distinguished lawyer and member of the Constitutional Convention, represented Salomon on this occasion. It was due no doubt to many other transactions of this character that Salomon advanced to the government large sums for which he received no return. A report of a United States Senate committee, made in 1850, upon the claims of Salomon's heirs states that he "gave great assistance to the government by loans of money and by advancing liberally of his means to sustain the men engaged in the struggle for independence at a time when the sinews of war were essential to success." For the most part, the money advanced by Louis XVI., and the proceeds of the loans negotiated in Holland passed through his hands. 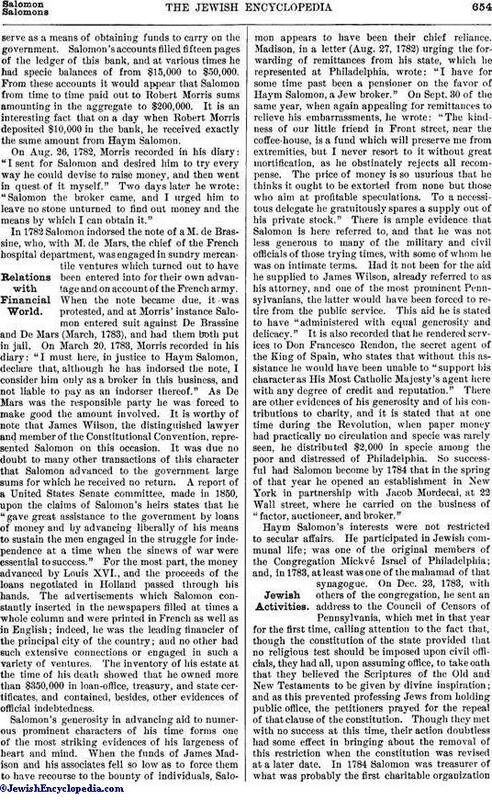 The advertisements which Salomon constantly inserted in the newspapers filled at times a whole column and were printed in French as well as in English; indeed, he was the leading financier of the principal city of the country; and no other had such extensive connections or engaged in such a variety of ventures. The inventory of his estate at the time of his death showed that he owned more than $350,000 in loan-office, treasury, and state certificates, and contained, besides, other evidences of official indebtedness. Salomon's generosity in advancing aid to numerous prominent characters of his time forms one of the most striking evidences of his largeness of heart and mind. When the funds of James Madison and his associates fell so low as to force them to have recourse to the bounty of individuals, Salomon appears to have been their chief reliance. 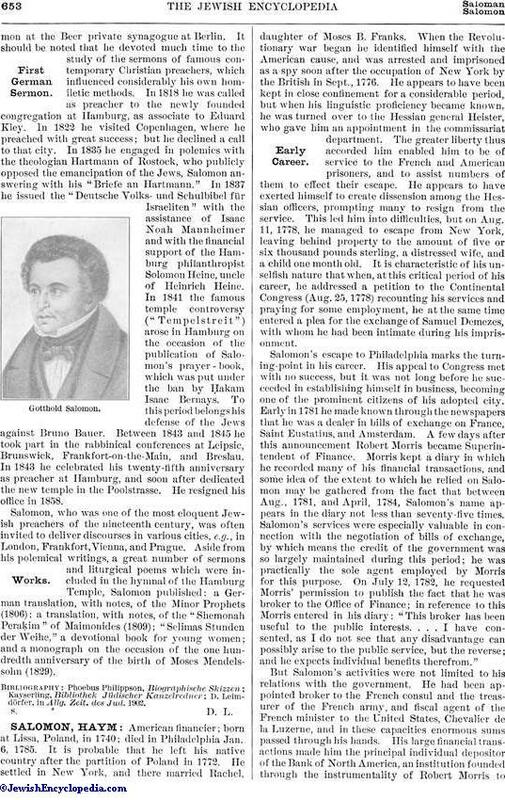 Madison, in a letter (Aug. 27, 1782) urging the forwarding of remittances from his state, which he represented at Philadelphia, wrote: "I have for some time past been a pensioner on the favor of Haym Salomon, a Jew broker." On Sept. 30 of the same year, when again appealing for remittances to relieve his embarrassments, he wrote: "The kindness of our little friend in Front street, near the coffee-house, is a fund which will preserve me from extremities, but I never resort to it without great mortification, as he obstinately rejects all recompense. The price of money is so usurious that he thinks it ought to be extorted from none but those who aim at profitable speculations. To a necessitous delegate he gratuitously spares a supply out of his private stock." There is ample evidence that Salomon is here referred to, and that he was not less generous to many of the military and civil officials of those trying times, with some of whom he was on intimate terms. Had it not been for the aid he supplied to James Wilson, already referred to as his attorney, and one of the most prominent Pennsylvanians, the latter would have been forced to retire from the public service. This aid he is stated to have "administered with equal generosity and delicacy." It is also recorded that he rendered services to Don Francesco Rendon, the secret agent of the King of Spain, who states that without this assistance he would have been unable to "support his character as His Most Catholic Majesty's agent here with any degree of credit and reputation." There are other evidences of his generosity and of his contributions to charity, and it is stated that at one time during the Revolution, when paper money had practically no circulation and specie was rarely seen, he distributed £2,000 in specie among the poor and distressed of Philadelphia. So successful had Salomon become by 1784 that in the spring of that year he opened an establishment in New York in partnership with Jacob Mordecai, at 22 Wall street, where he carried on the business of "factor, auctioneer, and broker." Haym Salomon's interests were not restricted to secular affairs. He participated in Jewish communal life; was one of the original members of the Congregation Mickvé Israel of Philadelphia; and, in 1783, at least was one of the mahamad of that synagogue. On Dec. 23, 1783, with others of the congregation, he sent an address to the Council of Censors of Pennsylvania, which met in that year for the first time, calling attention to the fact that, though the constitution of the state provided that no religious test should be imposed upon civil officials, they had all, upon assuming office, to take oath that they believed the Scriptures of the Old and New Testaments to be given by divine inspiration; and as this prevented professing Jews from holding public office, the petitioners prayed for the repeal of that clause of the constitution. Though they met with no success at this time, their action doubtless had some effect in bringing about the removal of this restriction when the constitution was revised at a later date. In 1784 Salomon was treasurer of what was probably the first charitable organizationamong the Jews of Philadelphia, a society for the relief of destitute strangers. 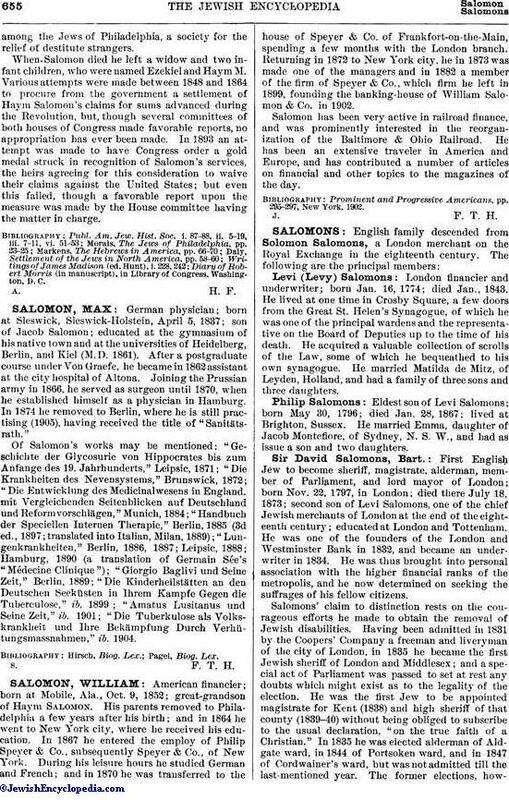 When Salomon died he left a widow and two infant children, who were named Ezekiel and Haym M. Various attempts were made between 1848 and 1864 to procure from the government a settlement of Haym Salomon's claims for sums advanced during the Revolution, but, though several committees of both houses of Congress made favorable reports, no appropriation has ever been made. In 1893 an attempt was made to have Congress order a gold medal struck in recognition of Salomon's services, the heirs agreeing for this consideration to waive their claims against the United States; but even this failed, though a favorable report upon the measure was made by the House committee having the matter in charge. Diary of Robert Morris (in manuscript), in Library of Congress, Washington, D. C.